Chaucer and the de la Poles. This is one of those surprising connection posts. It also reflects the way in which society changed as a consequence of the Black Death and the decline of feudalism. The descendent of an inn keeper became a Duke of Suffolk and was embroiled in the bloody aftermath of the Wars of the Roses. The Chaucer family were upwardly mobile, of that there’s no doubt. Geoffrey’s great-grandfather was a inn in Ipswich, his grandfather was a shoemaker – not a humble cobbler- think wholesale shoe sales with entrepreneurial tendencies; he was also a vintner. In addition, he had the good sense to marry a pepperer’s widow called Mary Heron which added a further very lucrative string to his bow. Their son, Geoffrey’s father, John Chaucer was an established merchant and freeman of the City of London. He was sufficiently wealthy for his aunt to attempt to kidnap him in order to marry his cousin when he arrived at a marriageable age. The plot was foiled but it demonstrates how much the Chaucer family circumstances had changed in four generations. As the Chaucers climbed the social rungs they became soldiers and served in royal households. 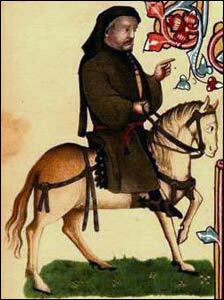 Geoffrey Chaucer was talented not only as a poet but also as a diplomat. It helped that he was married to the sister of John of Gaunt’s mistress – Katherine Swynford – which is in itself a fairly unexpected connection but one of history’s more well-known links. However it is in Geoffrey’s descendants that the really unexpected connection begins to take shape. Geoffrey’s son Thomas- there are some suggestions that Thomas was in fact John of Gaunt’s son but there is no evidence to confirm this- had a daughter called Alice who married three times. Her final husband was William de la Pole – who became the Duke of Suffolk. They had one son – John who married Edward IV’s sister Elizabeth which turned the de la Poles into Plantagenets which was an excellent step up the social ladder in the world before the Wars of the Roses but was not so useful in the Tudor world. Alice’s grandson John took part in the ill-fated uprising against Henry VII with Lambert Simnel. He was killed. His younger brother Edmund took on the family title but fled to Europe where he found protection at the court of the Hapsburgs. Unfortunately Philip the Handsome was shipwrecked on the English coast and Henry VII was able to have the troublesome Plantagenet returned to his care and a comfy room in the Tower of London. In 1513 Henry VIII had Edmund executed. The third de la Pole brother was called Richard who became a soldier of fortune and was killed at the Battle of Pavia – an event which Henry VIII celebrated. But who would have thought that any of the three were related to Geoffrey Chaucer? This entry was posted in surprising connections, The Plantagenets, Wars of the Roses and tagged Alice Chaucer, Alice de la Pole, Chaucer, Duke of Suffolk, Edmund de la Pole, Geoffrey Chaucer, John Chaucer, John de la Pole, John of Gaunt, Katherine Swynford, Richard de la Pole, William de la Pole by JuliaH. Bookmark the permalink.